Many dentists encourage patients to get dental implants as they are considered to be the next best thing to one's own natural teeth. Once affixed, dental implants are permanent additions to a mouth as they will be anchored directly to the jawbone of a patient. The process can involve multiple stages including restorative dental work to improve dental health, the affixing of a tiny but sturdy titanium stud directly into the jawbone to replicate tooth root structure and then the final attachment of a the permanent dental implant. 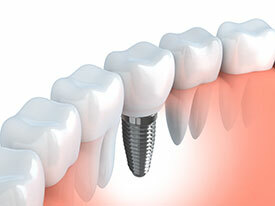 The dental implant process can take months of oral surgery and healing. Patients with healthy teeth, gums and limited missing teeth are the best candidates. Remember, if properly cared for, dental implants can last a lifetime!